A few weeks ago, my wife picked up a book called The Written Suburb at a Greenwich Village used bookshop about Chadds Ford, Pennsylvania, and how it was an invented, postmodern place, designed to become a mythological homeland of the American realist movement. As the area was home to painters like Howard Pyle, N.C. Wyeth, and Andrew Wyeth, its history was certainly intertwined with that of American art. The Brandywine River Museum has done a fine job selling itself as the First Church of Delaware Valley Realism and enhancing the myth of Brandywine River as a seat of not just Realism but also of the Real. With the news of the death of Andrew Wyeth, the whole question of whether the Brandywine River school really produced “art” is back in the news again. The Metropolitan Museum of Art in New York refused to show his “Helga” paintings on the grounds that they were not, or at least weren’t very good. The Museum of Modern Art keeps Andrew Wyeth’s most famous work Christina’s World (1949) in a back corner, and it’s always fun to watch people discover its presence. They stumble upon it, and are surprised at how it moves them. As an icon, they are completely ready for it to be trite and clichéd, but in person it still seems to catch people up. Art purists would say that the only valid art is work that’s done for art’s sake alone: without guile, without intention to build an audience, without regard to populism. Arguably, only art that fits this definition can advance what’s been done before it in the same vein: populism and intellectual progress usually don’t mix. However, another definition of art is any work that conveys emotion, and on this score, the Wyeths and the Brandywine River School perform well enough to merit attention. That 200 million people can name Wyeth as one of their favorite artists shows his communication has been effective, however invented or populist it may be. The intersection between art, populism, and commerce is an interesting place to poke around. Here are the seams of our culture, where values, money, and progress bang up against each other. The Brandywine River Museum touts the artistic authenticity of an invented place, and the Wyeths, Pyle, and Parrish are all promoted as invented artists, designed to insure the flow of tourist dollars into Chadds Ford and Kennett Square — beautiful places, to be sure, and if you squint you can convince yourself the place conveys the feelings the art is trying to make you feel — especially at this time of year, when the browns, greys, white and cold look and feel just like a Wyeth landscape. But in the end, that’s a leap of faith on the part of the viewer. Sometimes art requires the viewer to become complicit in its own invention. Glad to see this post, and interesting, or perhaps inevitable, that we would share interests beyond civic-oriented technology projects. My wife and I recently received a print of Wyeth’s “Ides of March” from her Aunt, who was a friend of his and would occasionally sit as a model for him at his home in Maine. We also have a print given to my wife from her father, that is at least thirty years old. Coming from California, these paintings definitely capture a feeling of an idyllic east for me, a feeling intertwined with my new extended family and their long history in New England. Being a musician, my take on your post brings up thoughts of Copeland, Gershwin and Bernstein. All of these composers sat at the intersection of high art and main street commerce. They are often used as “gateway” artists into the world of European classical music, because they are more palatable to modern American ears. I don’t disagree with these tactics, but the accessibility of the music shouldn’t detract from what is actually going on. Each composer has great depths and skill to their work, and all introduced extensive cultural mashup in their work that rival anything by Bartok or Dvorak. I think when art involves anything too current or familiar, it is to easy to dismiss as pop or commerce. Give it a hundred years, and perhaps the judgment of Wyeth and others will be more focused on the talent and less reactionary to his popularity. On the subject of Gershwin, this summer we were in Berlin for a couple of months and went to see Porgy and Bess at the Deutsche Oper as performed by the Cape Town Opera company, which was traveling there. The show was performed in English (albeit with heavy South African accents) and included German subtitles. Sommer! Und die Leben ist licht! It was quite a lot to keep up with. Seeing that music now, seventy years removed from its debut and a cultural lens or two away, it’s easy to see that it’s timeless and immortal; great, strong melodies plucked from the ether. At the same time, it’s a good thing that there are art purists to champion the unpopular and floggingly innovative — without that stuff, there’d be no progress, and there’d be nothing for popular artists to appear less extreme against in comparison. We’ve got the print of the dog on the bed, and we like it fine. It looks like one of the rooms in our 1920’s woodframe houses, and reflects the kind of staunch middle class American values that we think defined the World War II generation. My grandpa enjoyed painting. He usually painted landscapes, lighthouses, sailboats, etc. He would find paintings or photos in magazines and repaint them, sometimes trying to match the original closely, other times doing his own thing. My grandpa’s paintings may not classify as “art”, but I like them. 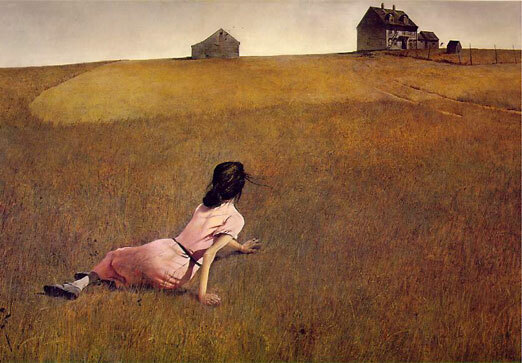 In retrospect, he was clearly influenced by Wyeth. At any rate, the bit I wanted to share was that the first time I ever saw “Christina’s World” was through his (many) copies of it. And one of his replicas had a striking difference from the original: a prominent “Burma Shave” sign in the foreground. 🙂 I suppose he figured that added a touch of “realism” (and humor).